All of us across the country have seen some extreme weather this year. 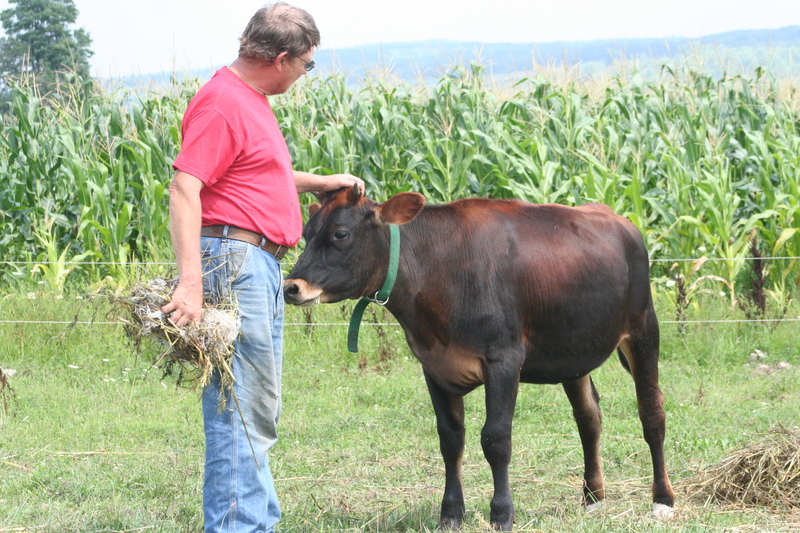 Farms with animals have to pay extra attention under extreme heat and cold, not to mention high winds and heavy rains. Here in Upstate NY, we aren’t facing winter colds as low on the thermometer as some of the others across the country but we are still facing morning temperatures of negative 6 and some wind chill factors. As any person would, extra care needs to be taken to ensure safety in such extreme cold. This is one of the reason we make sure that our animals have good shelter and a warm place to rest. 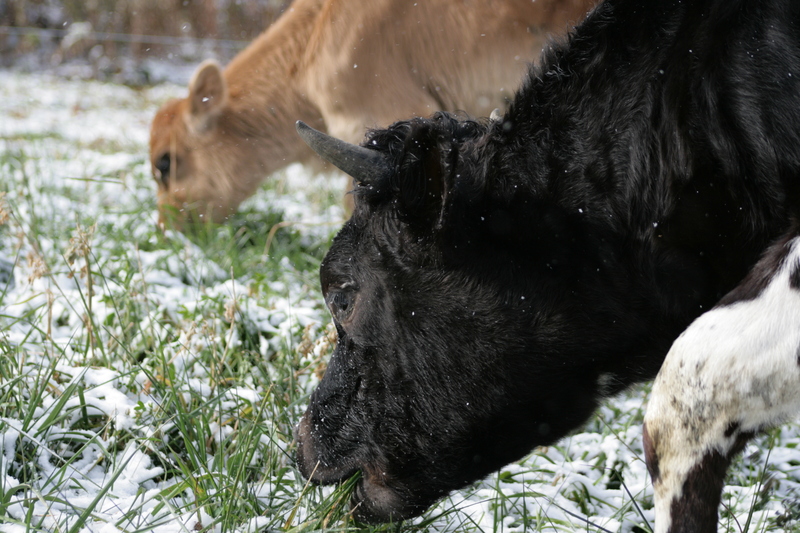 Cold stress in cattle is very difficult to deal with and should be monitored for. Cold stress in cattle is just like the stress of hypothermia in a human. Treatment is very much the same. It involves slowly warming the body to get body temperatures elevated without reheating too quickly. Cold stress slows heart rates down and often makes animals very latargic. To rewarm an animal here on our farm, it involves many trips from the house to the barn; blankets being warmed in the dryer for several minutes and then tucked inside a coat to be run to the barn; it involves warm water (often electrolytes to prevent dehydration); and hours before an animal is back on it’s feet again. As you can imagine it is a very daunting task. 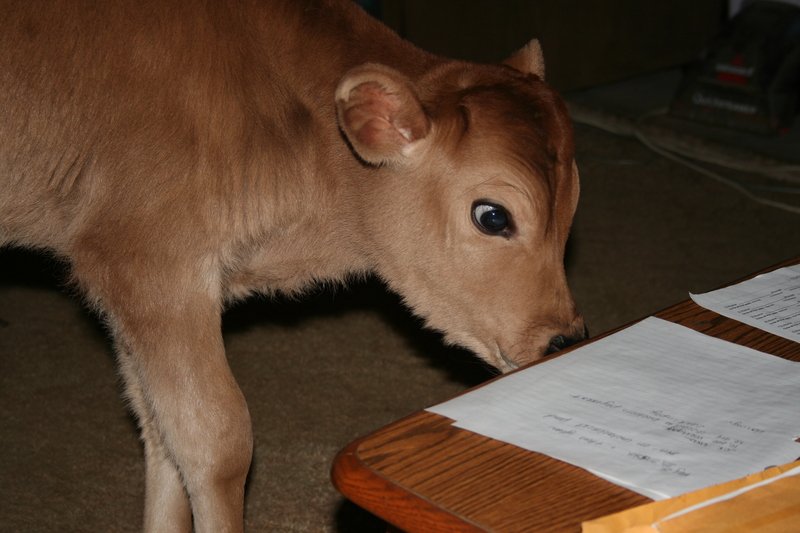 Calves are the most easily effected by cold stress. Without fat stores or long haired winter coats, they aren’t equipped to deal with these freezing temperatures. Calves can be stressed in temperatures at 40 degrees if the wind is blowing and there is high humidity. This is one reason why calf care is crucial. By closely monitoring how a calf acts and/or reacts to environmental conditions, you can determine a method of prevention. Many times, something as simple as a calf coat is enough to 1)block air movement and prevent body warmth from escaping and 2)provide a layer of protection against air moisture. 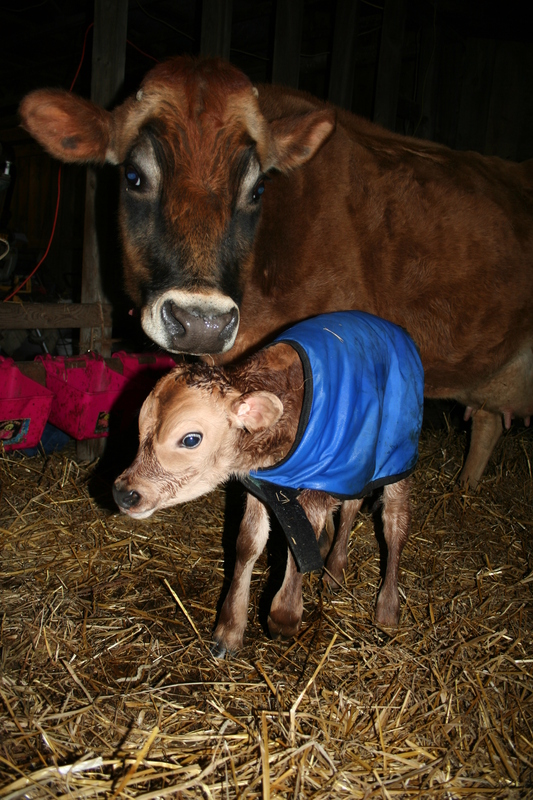 Adding a calf coat for cold temperatures in an attempt to keep a calf warm. Paying attention to bedding is also crucial. 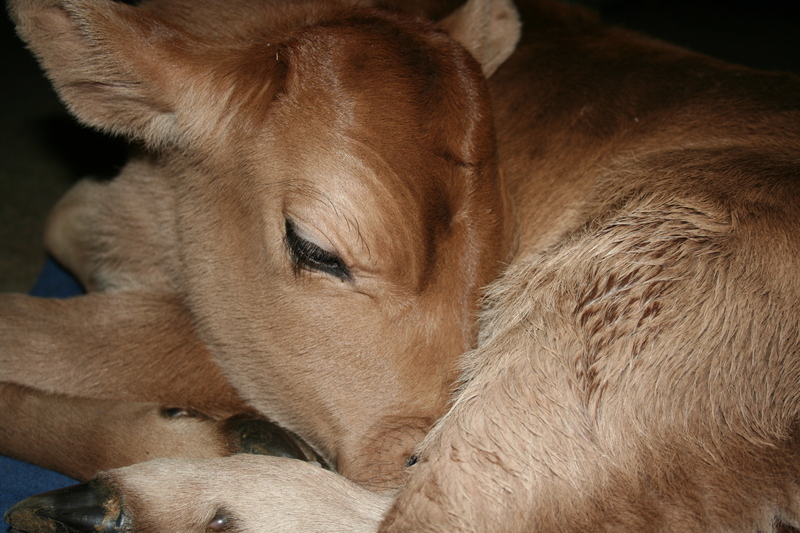 A calf will not retain body heat if it is laying on damp or wet bedding. We pay extra close attention to this detail year round but will add extra bedding with the use of additional straw to keep them warm. Wheat or Oat straw is important to have within our bedding mixtures because straw is actually hollow. Standard hay is finer and is natural a solid “stalk”. The hollow core of the straw will absorb body heat and help retain the heat. We double load bedding area with straw during colder months to ensure that the animal is nested down inside…much like the shape of a dog bed. What happens if the bedding and a coat aren’t enough? Sometimes we use heat lamps. The heat lamps, just like the ones used for keeping baby chicks warm, create a warm area under the lamp. Most often, this step will assist a calf from getting cold stress. Have we had animals with cold stress? Yes, we have. Last, we had a couple of calves group housed within the main area of our barn. We provided them with thick sawdust bedding and lots of straw in one area inside the barn. Unfortunately, overnight on a sub-zero night one of the calf decided to be a jerk and keep the other calf off the bedding. Calves do get territorial from time to time and this does happen. We did not anticipate it happening with two calves over a very large area…but it did. The calf rejected from the bedding then laid down on the concrete floor. Needless to say, as she slept her body temperature dropped and continued to do so until I made my way to the barn. After seperating the calves into different areas and getting her off the concrete floor onto good bedding…I started treatment for hypothermia. Warming blankets every 20 minutes, dribbling warm electrolytes into her mouth because she had minimal body function and a visit from the vet to make sure I was doing the right thing. The vet administered a shot of Vitamin B and told me to keep slowly warming her the way I was. Proudly, I can say that over the course of 12 hours, her body temperature elevated back to normal and she was back on her feed drinking and eating normally again. Today, she is one of my favorite girls and will be having her first calf this coming spring. What are we doing different this year? Well, we have a calf that is just days old now hanging out with me inside. With zero fat stores, a wet and slimy newborn coat and the temperatures continuing to drop…we were keeping close watch when he started to show signs of hypothermia with uncontollable shaking that didn’t stop. Not wanting to expose him to the other cattle yet…one option remained. He is a good boy. He lays on a blanket (with an absorbtion pad much like those used for puppy training). He comes into the living room a couple times a day to jump and run around so he stays flexible. When the weather gets warmer, we will start getting him used to cooler temperatures and slowly start working him back to the barn a little more each day until he is back in the barn full time. Is this the right way? Maybe not…but with me being unable to do some of the normal barn activities, I feel this was the best choice for his chance of survival. Personally, I rather enjoy the little guy being around. I will miss him when he goes back to the barn. 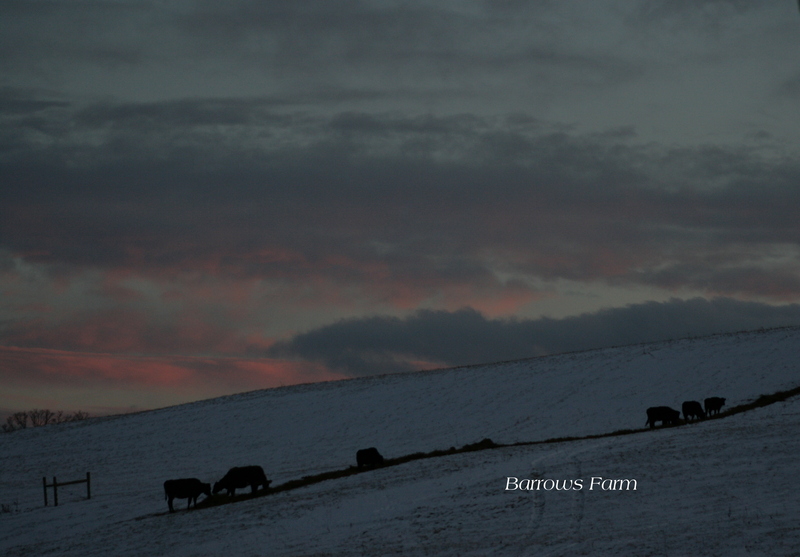 They say the life of a farmer slows down in winter. I beg to differ. 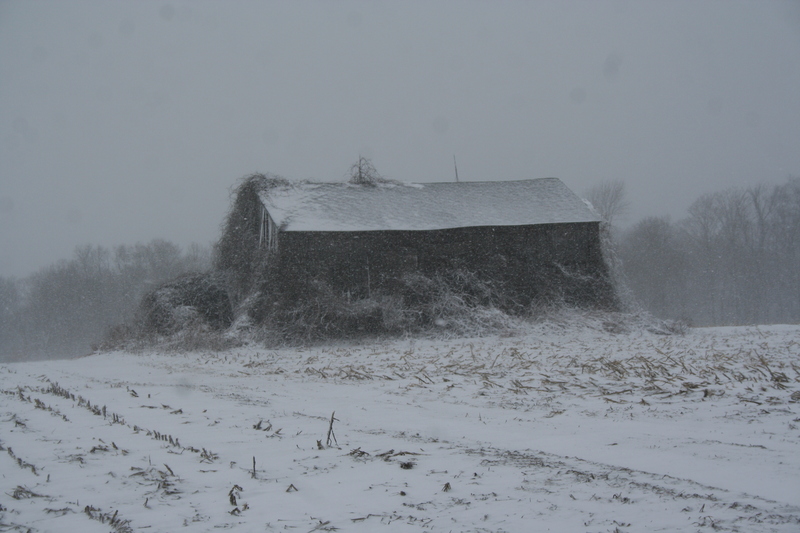 Winter time is usually the time we catch up on reading, sit through forage classes and plan out for the coming year. This year isn’t much different for me other than I am reading more on Holistic Land Management and taking some additional business and financial planning classes online. The extra course work, which takes a couple hours per week per class, really isn’t that much but it still takes time. I have some other classes that I am taking too. Ones on the food system in the US and another on human nutrition. Why am I taking these classes you ask? Looking at from my perspective, I feel as a farmer who works extensively with consumers about food production, it’s my job to be as informed as possible about how food impacts choices when it comes to how you eat. It’s also important for me to know and be able to express how food moves and travels because you never know someday we might be selling our goods all across the US. As for the business and financial planning classes, no matter how you want to look at farming or agriculture in general…it’s still a business where we need to make sure that we are planning and spending funds appropriately but also ensuring that we are making enough money to stay afloat too. Farming doesn’t have the profitability of many other jobs but it is rewarding in other ways. That’s one reason why it’s important to look at management from a Holistic standpoint since those methods also take a look at lifestyle too. On top of classes, I am still doing all of the same stuff…dealing with frozen water, cold stress in cattle, feeding hay bales, changing bedding, filling water jugs several times a day, gathering eggs, feeding chickens, caring for calves, keeping the fires going, cooking the old style home cooked meals and still trying to keep up with laundry, dishes and housework. Life doesn’t slow down for much on the farm. Sometimes we are forced to take breaks from the daily routine due to illness (and believe me, I have to be SUPER ill to keep me away from the barn) but it isn’t often. Even if we aren’t doing the manual labor involved for the farm, there are still other things we do. Research, reading and formulating crop charts, rotational grazing map or looking through seed catalogs…there is always something that can be done. I have been down and out for a couple of days with one of those illnesses that prevents me from standing too much…but I still didn’t miss the birth of the first calf of 2013. I even managed to capture a video! I didn’t get to stay out there too long and I am thankful for a cow that is awesome about birthing. I missed the first steps and the first suckle, which happen to be some of my favorite moments on the farm. It’s rather depressing to miss such moments too but, sometimes we have to take care of our own health first or we won’t be any good for anything at all for a very long time, if ever again. So for now, I will deal with my winter blues the best way I know how…learning, researching and communicating via books and the internet. 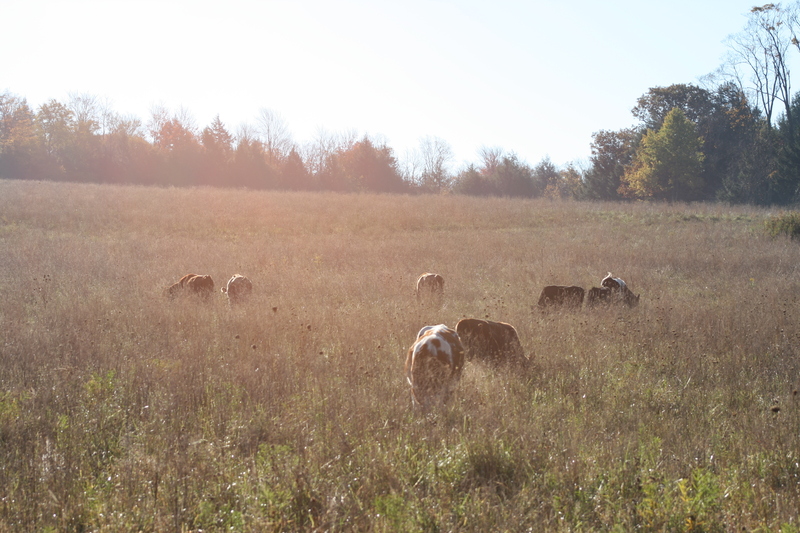 I have to say, I have had some awesome conversations over the phone too about our grazing plans, the success we have had and why I think it’s important for others to consider rotational grazing. Being down isn’t all bad…it just takes some adapting. I will write more soon about extreme animal care and welfare. I want to give some details about how we cope with winter months when temperatures hover around ZERO with freezing cold wind chill factors, what we do to ensure animal safety during winter, and how grazing has also been incorporated during the winter months. I may have to write up a series of articles but, I think it’s important that people see just how much care and planning goes into animal care during extreme weather. Hope you are all staying warm…and I will leave you with a photo to contemplate for the next blog! Have a blessed day! Here is Abel…warm, relaxed and sound asleep. What’s “off” about this photo? I have to say…it isn’t gifts or spending time around my crazy family this holiday season that has me all excited like a kid on Christmas morning! IT’S MY GROWING FRESH CUT CHRISTMAS TREE! I have looked all over online to see if this is something normal…with ZERO results. We cut our tree down on December 1st. It’s one of the trees that Mr. Farmer and his two children planted about twenty years ago…or maybe the offspring from one of them anyway. On the first, we had a couple of visitors from the NYC area come up to pick out a couple of trees to take back. While we were assisting them, we figured…hey, might as well cut our own. Makes sense right? Mr. Farmer did the hard work (sarcastic) and cut the tree down. We loaded in the back of the pickup and drove down of the hill. I trimmed it up within an hour or so and got it standing in our living room. It was a little too tall (aren’t they always?) so I trimmed the top spire down to fit my angel, strung the lights and gave it some cold water. I have to admit…it sat here for almost two weeks with nothing but a couple strings of lights and some additional pine cones wired on. I check the water daily and when it calls for a drink, I have been adding a little warm water. I finally rolled around to getting some ornaments on it last Friday. Not many of them but just enough to make it look like a Christmas tree. Everything has been going just fine, typical and normal until last night. I came out of the bedroom door (the tree is straight ahead and maybe six foot away) I noticed these white looking “bumps”. After turning on the lights, I thought I was seeing things. At first, I thought we had some type of bug growing all over on the branches. After getting the flashlight and my glasses….to my astonished surprise here’s what I see. In all my years, not on my tree or others I have seen, have grown pine cones once cut! If anyone has any idea on how I did this…PLEASE comment and let me know. I have done several internet searches to try to debunk this fluke of nature…with no results. One awesome thing….I think I have the coolest Christmas tree EVER! Even though the temperatures are above freezing already this morning, at a whole 32 degrees…It sure hasn’t been that way for the past two or three days. 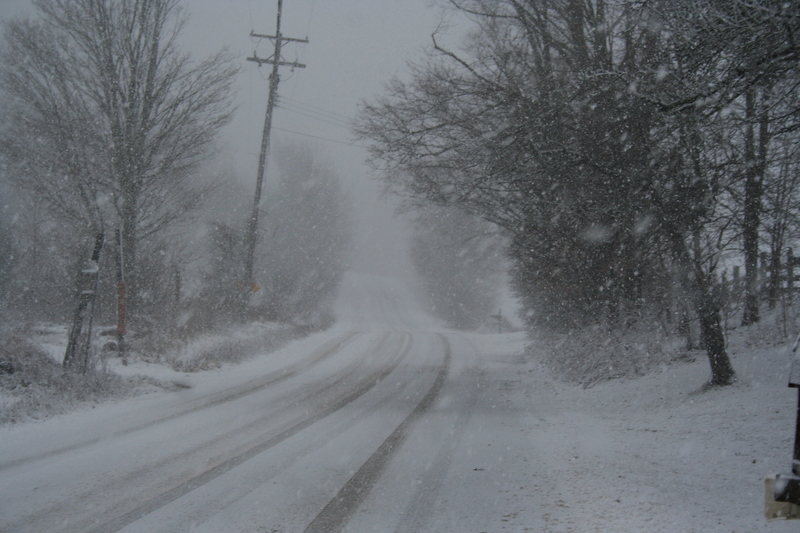 On Friday, we got hit with extremely high winds with some gusts over 40 mph and snow. I don’t mind the snow. I actually think it’s good to get some snow. Especially when the ground is already so saturated from all of this strange weather we have had this year. Buffalo, which is about a three hour drive from here, is 40 inches below their average snow fall accumulations for this season. We have had more rain than I can ever recall and there have been days in January that have days in the 40-50 degree marks. But on Saturday, the thermometer decided to plunge. It was 9 degrees out there when Mr. Farmer went out to do morning chores. He had a few problems getting out little milking pump started but, everything else went alright. No frozen water lines, no cold animals and no sludge for oil like I had yesterday morning when I went out. Sunday morning brought a headache, sore muscle and stress. One of our calves got cold stress. Cold stress in a calf is very dangerous. It is actually a form of hypothermia. The poor girl was our there shaking like a leaf in the breeze. She wouldn’t eat or drink. Having to bottle/force feed a five month old animal isn’t the easiest thing in the world. I didn’t want her to get dehydrated and I also know that giving her warm liquids is a good way to warm her up from the inside out. After discovering that my girl was so cold. I decided to take a peek at the thermometer again. It turned out to be a big mistake when I pulled it up on my truck when I was headed to go pick up our weekly feed. After the half hour feed trip, I had to work on getting the water lines unthawed. During all that, I had to keep checking on the heifer calf, making trips to the house to warm up blankets for her. Then the milker pump needed fixing. Mr. Farmer put on a different motor, cleaned it all up and warmed the oil (which turned out to be the only issue). Then we cut firewood due to the fact that we were burning through lots of extra. All of those winds seemed to find yet more cracks in the walls of the house. At one point, the whole house was at 51 degrees. Thankfully, we didn’t have any frozen lines. We built a fire in the fireplace for added warmth but only ended up with temps around 60. The chickens stayed nice and toasty inside of the chicken barn with their heat lamps. Believe it or not…they actually ALL laid an egg yesterday too. That was a whole boat load of eggs and more than my poor little bag could handle. I had eggs in my coat pockets, the front pouch on my hoodie and a couple in my hat along with the one’s in the bag as I raced hatless to the house! 45 eggs in total. My fingers and toes still hurt from frost bite but things are looking better for the time being. I guess that eventually, we will all pull through this and be alright. At least, I sure hope so. And here I was hoping for a better, even start to 2012. So far, everything has been full of severe swings of ups and downs…one positive thing, it has to get better from here! Hope you are all staying warm and dry. God bless. There are just too many things to worry about tonight. It’s now 1:37 am on Christmas Eve. I have done ZERO shopping, just had one of the worst days of my life and lost one of my girls. Not even Xanax has a cure for what ails me tonight. I keep thinking and seriously second guessing myself every step of the way. My Scarlett girl has made me triple guess myself. I am slowly dying on the inside, swirling around inside my over stuffed brain, trying to figure out what to do. As a small farmer, I took a huge hit today. Not just in a vet bill or emotionally either. I have been hit in planning. These three young heifers were suppose to be the next additions to my milking herd. And now I am down one of them….one that was going to be an important part of that plan. Farming is always a huge risk. I try to reduce as many risks as possible. 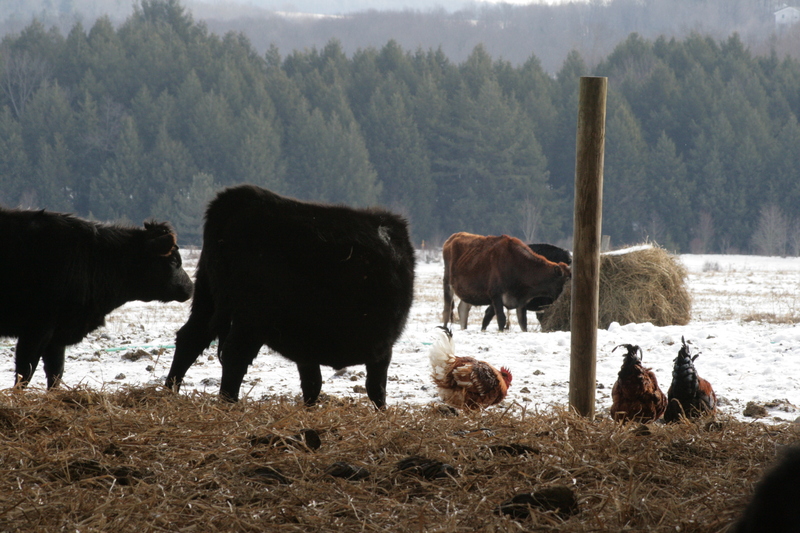 I keep barns clean, feed good food, make sure there is always lots of fresh water….but most people don’t realize what kinds of investments we small farmers put into time and energy to ensure our stock stays healthy and happy. Some people say that livestock are not pets, that we shouldn’t befriend them…well critics be damned! I know all of the cows, calves, bulls and steers names. I know their personalities. I know what foods they like and don’t. I can almost map their days out on timeline sheets better than I can my own. I know when they are tense, scared, nervous or not feeling well. I know my cows better than I know myself! After yesterdays incident, I keep asking over and over, and over some more…how could I have gone so wrong? I need this answer. I need to know this for future reference…Her death will not be in vain! Farming is about always learning. Learning the hows, the ways and the whens. Everyday presents itself with new challenges (which sometimes do not turn out for the better, no matter how hard we work and pray for a good outcome), new ideas and sometimes even new practices. To me, all of these questions and concerns have GOT to have the cows interest, welfare and happiness as the main priority. The Holidays don’t change the day to day operations, the wandering minds or the worry. Yes, we may sit down to a large meal with more family than usual and escape some of our harsh realities, but for the most part…it is just another day around the farm. I really need some sleep…still need to do my shopping for Mr. Farmer and I still have no idea what to get. Later is a trip to the local feed store, time to move a couple more bales and somewhere in there..fit in time to go to “town” to pick him up something. Life never seems to slow down!